From a dairy factory at Pukekura, Waikato, Henry Reynolds launched his Anchor butter. The brand name, allegedly inspired by a tattoo on the arm of one of his workers, would become one of this country’s best-known trademarks. New Zealand’s dairy export industry developed following the advent of refrigerated shipping during the 1880s. Reynolds was one of the country’s first dairy factory entrepreneurs, establishing several plants in Waikato. He built a cool store in London and sold direct to shops there, as well as exporting to Australia and Asia. The Anchor butter recipe came from an American, David Gemmell, who was farming near Hamilton. Reynolds was impressed with both the taste and longevity of Gemmell’s product. When Gemmell announced that he was moving back to the United States, Reynolds convinced him to delay his journey for six months to help him establish his dairy factory. 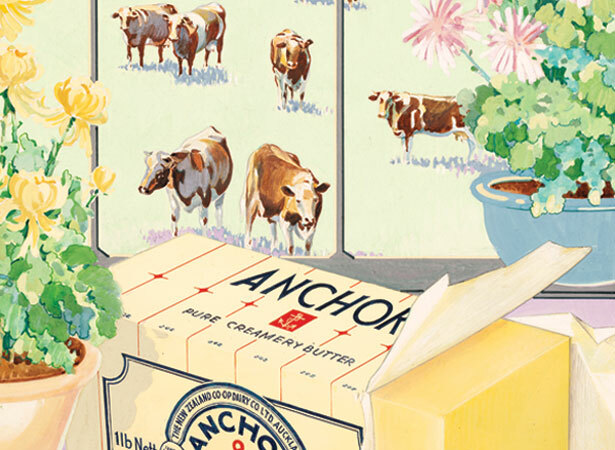 The Anchor brand quickly established itself as a market leader and the company’s butter, milk and cheese are still familiar items in households here and around the world. We have 2 biographies, related to Birth of Anchor butter. New Zealand's first grapevines planted?